Prompt from Joanne Merriam: write a poem on memory and loss. Memories are always of the moments that are lost. when the sea will not open path for you. dance in the luminescence of now-ness. silver hatchwork in the dark woods. into the dark heart of nowhere. rack the grace of morning. Kelli Russell Agodon writes, “ Make a list of your favorite words today. Write a poem that uses the words you wrote down.” I have used phrases instead of words in my poem. I have been reading a few poems that we selected for our seventh graders. I wrote down phrases that stayed with me. They are ‘swelling chants’ from Amiri Baraka’s poem ‘Ka’ba’, and ‘breaking light of love’, ‘tear blinded sight’ and ‘grace of morning’ from James Weldon Johnson’s beautiful poem ‘The Glory Of The Day Was In Her Face’. I so much needed a cup of tea. I sipped tea, looked out of the window at the backyard of my office that has this large plumeria tree that drops numerous pink secrets on the manicured lawn. 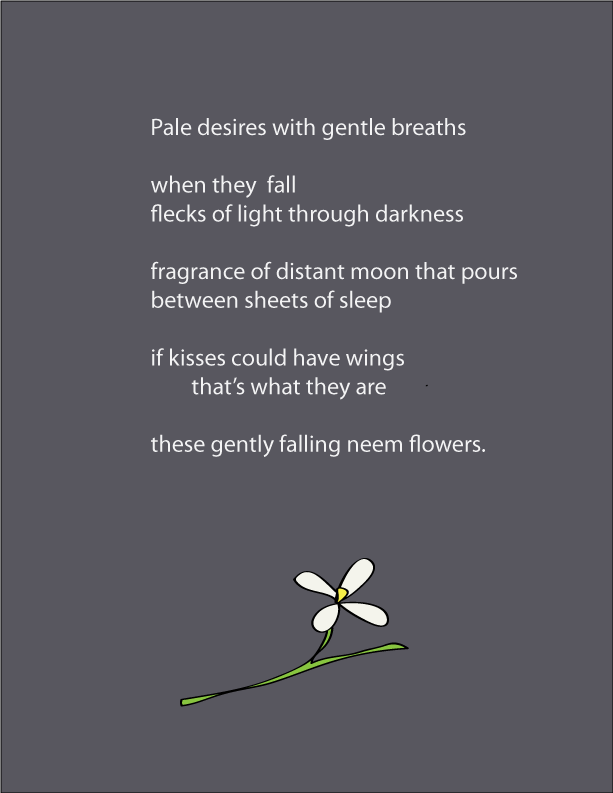 My poem owes to the prompts as well as the plumeria tree that I have observed day after day spill flowers. When I write poem after poem like this for 27 days, there comes a time when the process note is longer than the poem. Am I tired? You bet! that I carry in my prayer bead.